Making a decision about where to send your child to school is often one of the most difficult decisions parents make during the early years. Should you enroll them in a French immersion program at the elementary level? What about a Montessori school or one that uses the International Baccalaureate program? How can we prepare them for an entrance exam and should we choose the private sector for high school? There are many options available (and even more for students with English eligibility). We hope we can make this decision a little easier for parents; for 12 years, Montreal Families has been hosting an annual Education Fair, bringing representatives from private and public elementary and high schools as well as tutoring and learning centres under the same roof. (Although our fair is held in Pointe-Claire, schools and organizations from all over the island will be represented). 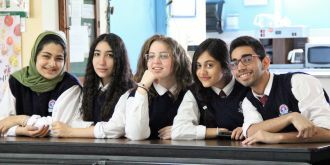 The Quebec Association of Independent Schools (QAIS) will be on hand to give out information about its 24 English elementary and secondary private schools. The West Island-based Lester B. Pearson School Board will be present again this year, ready to give guidance about all their schools, specialty streams and international programs. The Canadian Parents for French, a national network of volunteers who are dedicated to promoting and creating French-second-language learning opportunities for young people. In total, there will be 41 booths representing more than 100 public and private schools, tutoring centres and other education-based programs around Montreal. Make sure to bring the kids along; Lulu the Clown will be on hand to twist and tie balloons into hats, animals and (almost) anything else your heart desires. FREE admission. FREE parking. FREE childrens' entertainment.